Holbrook Junior High school is a completely different school! PBIS has tremendously changed our school for the better. I have worked at this school for 8 years now. I can tell you, I’ve seen it change before my very eyes! I am also a proud member of our PBIS team. I have seen our Tier 3 kids move on to become better students, athletes and overall better individuals. We are located in a very rural area. 80% of our students travel 1.5 hours a day on a school bus to get to our school. Some come from homes without power and running water. Most of those kids carry bigger burdens than some of us will ever have to face. Holbrook Junior High school has become a warm and inviting place. The data doesn’t lie! PBIS has made our teachers, administrators, staff and students true believers! One of my Tier 2 students told me that she feels safe at school. We have included everyone in on PBIS! Our bus drivers, cafeteria workers, substitutes and even our janitors write student their Beep Beepers! (our positive tickets for rewards!) no one is excluded from our Positive Behavior system. I am a firm believer that this program has and will continue to change our school for the better! 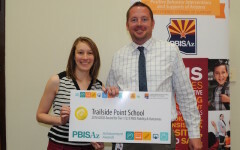 Trailside Point is a great example of how PBIS is not just an acronym, but is a consistency of behaviors and actions that can be seen and felt across campus. When you visit Trailside Point it is evident that students, teachers, and parents all know the schoolwide expectations. This positive culture is not only seen in the classroom but anywhere on campus that you wish to visit. 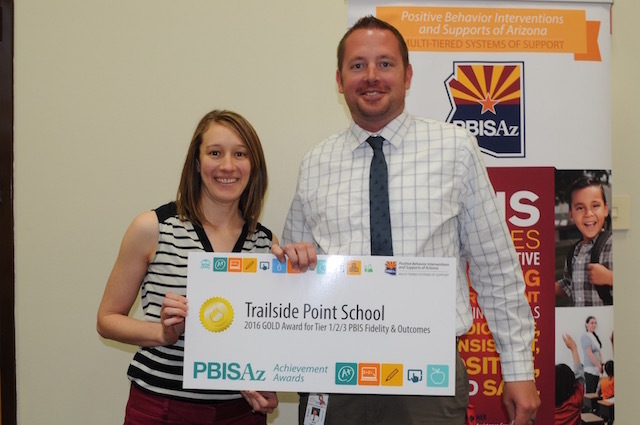 PBIS at Trailside Point School has played a big part in the lowering of negative behavior referrals and an increase in academic achievement. However, that does not tell the whole story. That story is told day in and day out through consistent behaviors by parents, staff, and students. Also, a willingness by parents, students, and staff to work together to make sure Positive Behavior Interventions and Supports are practiced, data is analyzed, and regular modifications are made to continuously improve Trailside Point School. SHARP School began implementing the PBIS system in the 2012-13 school year. 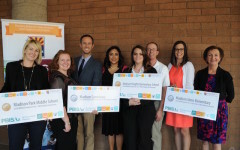 SHARP is a specialized Focus School/Program in Mesa Public Schools that supports students with significant academic and behavioral challenges. While SHARP had experience with working through challenges with students, we were looking for an improvement in pro-activeness versus reactiveness with our students. Dealing with a high number of challenging behaviors also had an impact on the schools culture and climate. 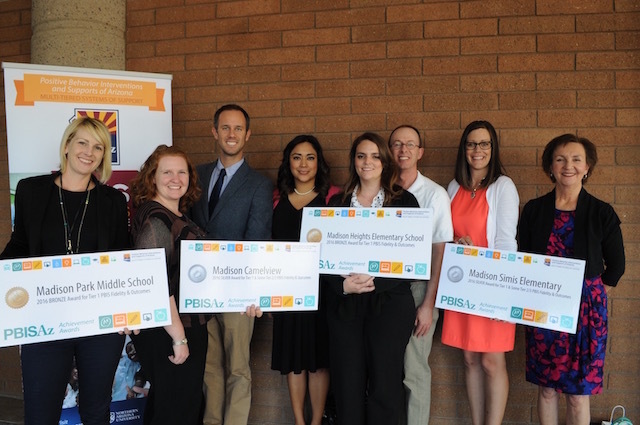 Motivated by the mighty purpose of PBIS, SHARP has been reformed into an elite academic and behavioral service model for Mesa Public Schools. 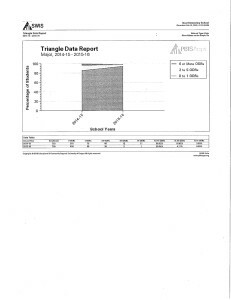 Immediate results were achieved which included a decrease in behaviors and an increase is student and staff morale. As SHARP has continued with PBIS and embedded multi-levels of support, we continue to see a decrease in behaviors, restraint and seclusion as well as an increase in academic success for our students. SHARP embraces changing adult behaviors to improve student outcomes. PBIS has provided SHARP with a system that now allows staff to provide an uncommon experience for our students, allowing the students to reward us with an uncommon effort. We have proven that the system can work for the most challenging students and change the course of our student’s future. 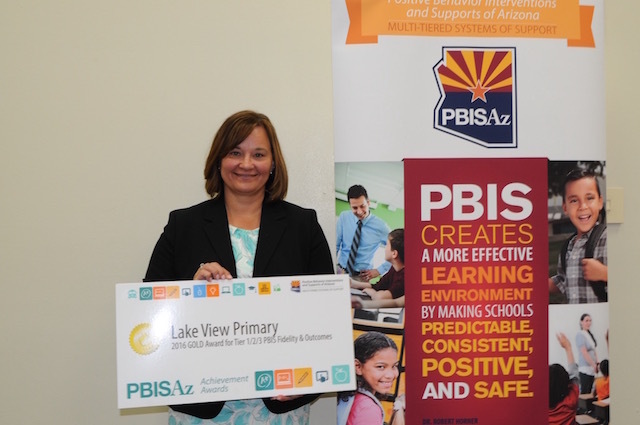 Lake View Primary is a K-2 school where teaching student’s appropriate behavior is significant to the success of learning for their future. We have increased school safety and climate by being clear in the expectations for all areas of the school including classroom, playground, assemblies, hallways, bathrooms and bus. These expectations set a positive climate for reinforcement of all students by all staff. Parents also comment of the positive climate we have established for our students to learn in. 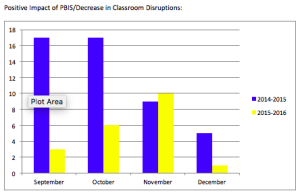 With the PBIS system, we have decreased behavior disruptions by a significant decrease each year. This allows students to be more focused on learning academic curriculum. Let’s teaches spend more time on focused teaching, and support staff can focus on tier II and tier III needs. 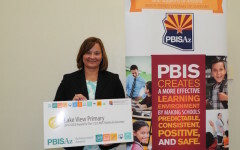 Lake View Primary has seen a decrease in Office Discipline Referrals and Suspensions from prior years. Students at such a young age need to be in the classroom to learn crucial skills and standards. We have been able to put support in place for students who need it that allows them to stay in the classroom. Students at Lake View Primary are learning to be socially responsible and are developing self awareness. This allows for a more positive environment for learning. Using PBIS along with Positive Action has decreased the number of Office Discipline Referrals, replaced inappropriate behaviors with positive behaviors, and increased student academic progress. It also carries over to their lives outside of school. 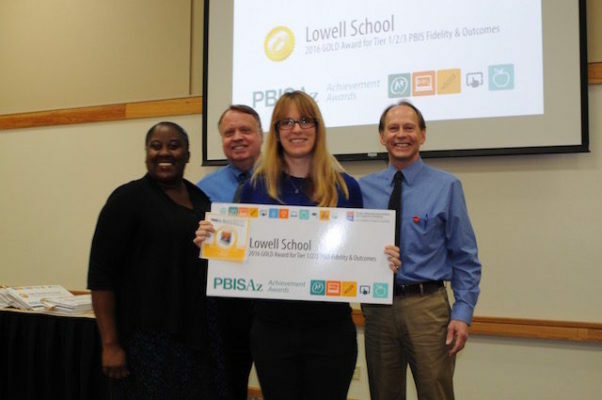 Lowell Elementary School is proud of our PBIS efforts. We have seen significant progress in our data, specifically in ODR and suspension reductions (about 75% since our first year of implementation). There is also a noticeable difference in our school’s climate. Teachers and students speak a common language; meeting an expectation is reinforced in a meaningful way and not meeting the expectation is viewed as a teachable moment. It is amazing to see a Kindergartener on the playground who excitedly runs over to tell you that he got a ROAR card this morning for being Accountable because he finished his work in class. Data-driven is no longer just a catchphrase at Lowell. We use data to inform our decisions which positively impacts our choices about students, both academically and behaviorally. We are also more mindful about our progress and consistently look for opportunities to improve our outcomes. We have room to grow, but are on a great track. Lowell Tigers ROAR! 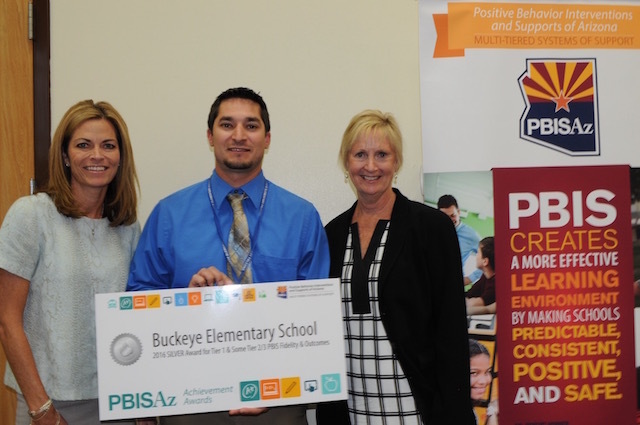 At Buckeye Elementary School PBIS has truly provided us a platform to increase student success through a campus that focuses on providing positive reinforcement for all of our students and staff. By decreasing the number of days that students were suspended, we have increased the number of days that students are receiving instruction. 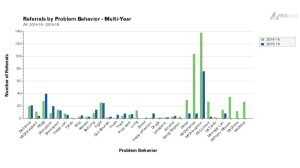 In addition to increasing the number of days when students are in the classroom learning, we have also decreased the frequency of several problem behaviors. The number of referrals for minor disruption has decreased which is another way that we are increasing the time focused on classroom instruction. This shift allows us to provide our students with the much needed academic supports on an even more consistent basis. PBIS has impacted WestPark in lots of great ways! PBIS has helped us develop a proactive approach to promoting positive behaviors, rather than reacting to the negative ones. PBIS provides WestPark the necessary tools for success through evidence based practices; which has promoted student achievement and growth. Our PBIS teams are not only recognizing our students with our Paw Power tickets, but our staff is being recognized with them as well. Receiving recognition for meeting our school-wide expectations has facilitated both our staff and students to become more aware of their behavior. This has allowed them to develop a strong sense of pride in our school. Westpark continues to benefit from the overall rollout of PBIS with a mass reduction in disciplinary referrals, increased attendance, and positive climate on campus. This has enhanced both faculty well-being and the overall student drive to succeed. Overall, the staff at WestPark are thankful for the framework PBIS has provided. We feel this framework has allowed our school to establish a safe, caring, and positive environment; which is crucial for student and staff success. PBIS continues to have a tremendous positive impact on the school climate at Inca as the staff, students, and parents have a set of clear, uniform expectations that focus on noticing positive rather than negative behavior. Receiving recognition for meeting these expectations has helped students become more aware of their own behavior and allowed them to develop a strong sense of pride in their school. Everywhere within the school, students are excited to be caught doing something correctly and awarded a Panther Pride ticket by a teacher, staff member, or administration. This consistent acknowledgement helps to encourage positive behavior, as students see the immediate reward for following the rules. Inca’s SET results have revealed a 95% implementation rate for Tier 1, and our school leads the district with 192.5 instructional days gained. The use of the “check in-check out” system for at-risk students has given them the tools and the opportunity to be successful by providing them with a mentor that can positively impact their behavior and give them a safe outlet to talk and discuss any issues. 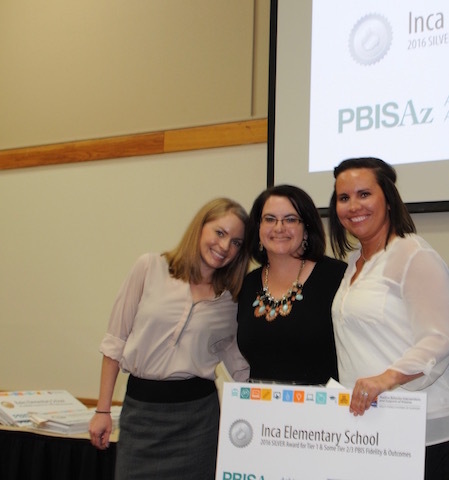 Overall, the teachers and staff at Inca are thankful for the PBIS framework and feel that it has helped Inca to establish a safe, caring, and positive environment that is crucial for student success. Positive Behavior Intervention Supports (PBIS) has been in place at Stephen R. Jasinski Elementary School since the 2012-2013 school year. As we enter our fourth year of our program, our staff has a clear understanding of our PBIS school wide protocols. This is evidenced by our recent School Wide Evaluation scoring of 97%. Our SWIS data continues to show a decrease in lost instructional minutes due to the decrease in in/out of school suspensions. Our atmosphere has a positive feel and our students have tools to assist them in resolving conflict. Students earn incentives (positive paw prints) for individual positive behaviors and work together as a class to earn class paw prints. As our school grows and we welcome new students and staff, PBIS allows us to use a common language and methodology to continue to build a positive culture for our campus. The vision at Skyline is to ensure all kids receive the extra time and support needed to achieve at a high level. This vision refers to the school culture, as well as the student academic achievement at Skyline Ranch K-8 School. Teachers are teaching the expectations and building relationships with students, which has a positive effect on academic growth. 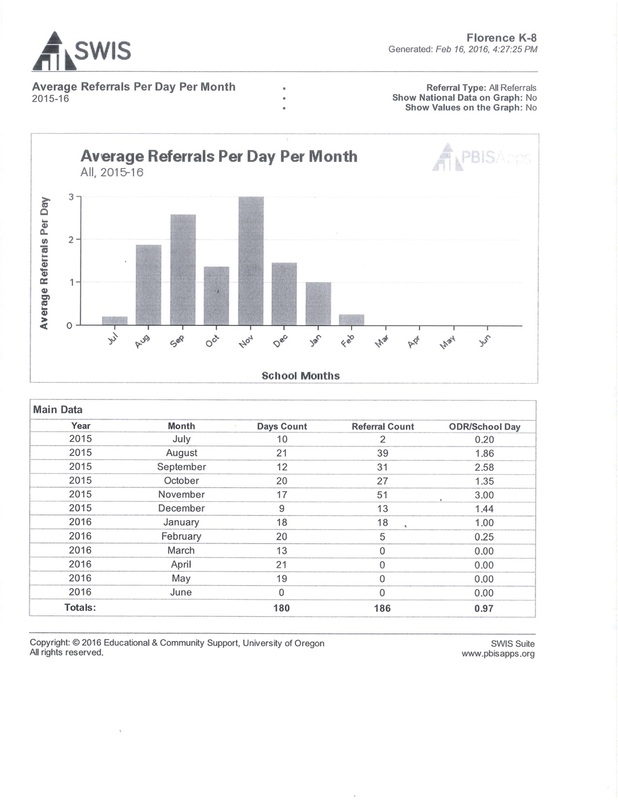 From the middle of the initial year, daily referral rates have decreased by 81%. 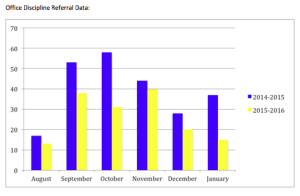 Now that referrals have decreased, it has been necessary for other systems to be implemented. We have over twenty students who are involved in the check-in and check-out process that we call the PAWS Club. There have been very positive gains for over 90% of the students according to their grades and comments from their teachers and parents. A Tier 3 Team of educators meets once a month and invites teachers that have students who are struggling with their academics or behaviors, and haven’t responded well to the teacher’s supports. The team collaborates together and comes up with research-based interventions for the teacher to try in class so she can collect data to bring back to the team. In addition to site based Tier 3 strategies, Skyline is also the home to the district-wide Tier 3 intervention known as the BEST Program (Behavior Education and Skills Training). Five students have already met their goal and returned to their home school. There are currently nineteen students in the program and 84% of them are participating in general education classes with their peers. Transitioning them back to a general education setting at a slow pace will ensure their success. Even though these students require a higher support of behavioral needs, they are still held to high academic expectations and commended when they reach their goals. The PBIS program has continued to support our school’s focus on being prepared, acting responsibly, respecting oneself and others and promoting academic success through learning. 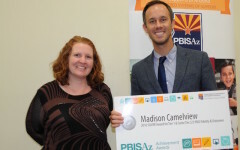 This will be Madison Camelview’s second official year of implementing PBIS Tier 1 school-wide and the first official year of implementing Tier 2 supports. Coming to this school I found that there was already a culture of positivity and explicit instruction and reinforcement of expected behaviors. The staff rollout was smooth as this was not a brand new concept and the students and families had already been familiar with our C.U.B.S. expectations. Our students come to us from many different backgrounds, but they have a clear understanding of what they must do to be successful at Camelview each day. 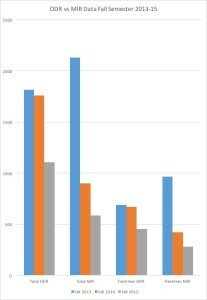 Since the implementation of Tier 1 and 2 supports our office referrals during unstructured times have gone down (ex. 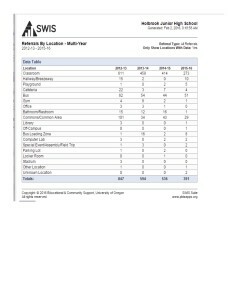 Playground, Cafeteria, Bus) and more notably is our decrease in students needing Tier 2 supports. In addition, our academic data is trending positively in student proficiency as well as annual growth. As we move forward, we continue to improve our systems to ensure sustainability throughout staffing changes to keep our school a safe learning environment for our students. As PBIS continues to evolve at Simis many changes in climate and behavior can be seen. Prior to PBIS, it was common to have a stampede after each recess bell. Since teachers have been consistently reinforcing the use of walking feet we have seen an increase in the number of students walking to line. This has also resulted in a decrease in injuries and trips to the nurse. This year we have experienced many changes around campus as a new school is being constructed on former play spaces. In addition to continuous construction, all staff moved rooms/offices over Winter Break, students are learning to navigate new spaces, and a third of our staff is new. 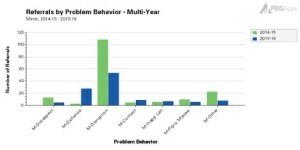 The strong PBIS foundation in place at Simis has resulted in smoother transitions during this year of change. .
PBIS has provided teachers with a common and systematic set of procedures for dealing with behavior problems. Being consistent with these procedures has resulted in fewer Minor Incident Reports, allowing the PBIS team to view and respond to accurate data that correctly identifies students needing additional supports. Twin Peaks Tiger Cubs are “Respectful, Responsible and Ready to Learn.” Over the past decade, Twin Peaks Elementary School staff members have diligently worked to improve our Positive Behavior Intervention Supports program. Each year, we develop an action plan to identify areas of concern and improvement. An evaluation of our office discipline referrals, Student Climate Survey, The Dynamic Indicators of Basic Early Literacy Skills Next (DIBELS) scores, the School-Wide Evaluation Tool (SET) and the School-Wide Tiered Fidelity Instrument (TFI) demonstrates that we have been able to positively impact our students’ growth in their positive behaviors, student safety, and academics. 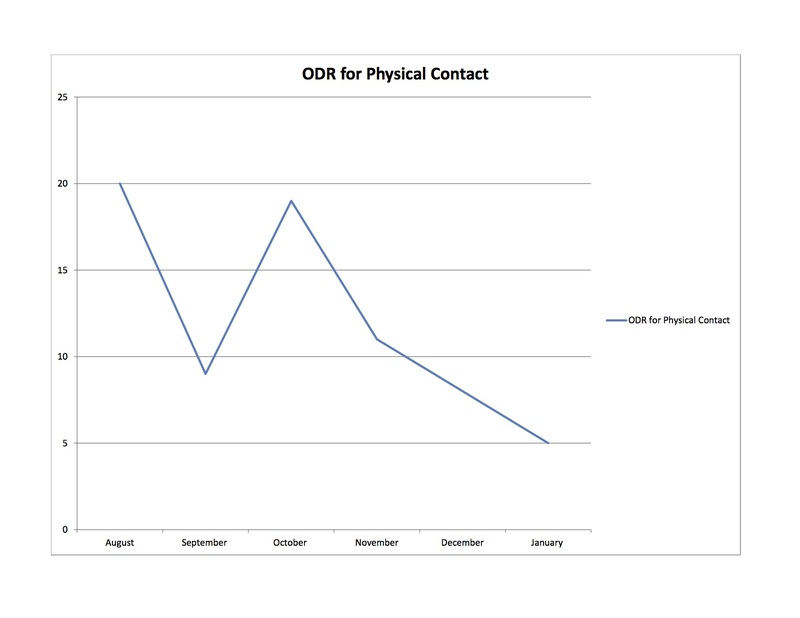 “Respectful”–Office Discipline Referrals (ODR): Between 2012 and 2015 we had a 21% decrease in referrals. This was accomplished by promoting positive behaviors school-wide using the PBIS Tier-leveled Interventions. 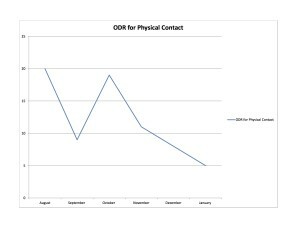 (See data graph). Students with consistent referrals were given opportunities to make personal improvements with various individual interventions including adult mentors, school counseling, behavior plans and positive reinforcement. “Responsible” –Student Safety: Through our ODR Data we identified a need to specifically focus on reducing bullying behavior. 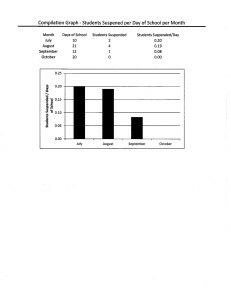 We accomplished this goal with a 25% reduction (see graph) by incorporating interventions at all 3 tiers. 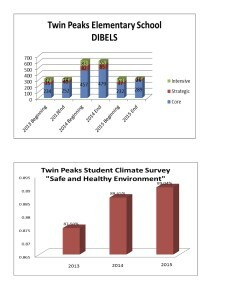 Over the course of 3 years, students reported on our Climate Survey (see graph) an increase of feeling safe and healthy within our school thereby demonstrating that our PBIS action plan and interventions are having a positive impact. Students participate in school-wide, classroom and individual activities that promote and support positive relationships. Our students know how to stand up to bullying and be “Bystanders that Rule” at Twin Peaks Elementary School. 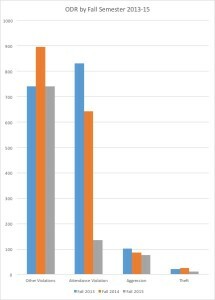 “Ready to Learn”–Academics: Each year for the past 3 years we have seen an increase in academic growth of our students in the area of reading (see graph). Our goal was to improve the number of students who achieved the benchmark in reading. Students are identified and monitored through our Child Assistance Team, DIBELS testing, and other individual interventions in order to ensure that they are “ready to learn.” Teachers are provided professional development on reading instructional strategies, and parents are provided with resources for helping their children become better readers at home. Students receive positive reinforcements on a daily basis, as well as monthly drawings for ready to learn behaviors and quarterly awards. We have seen an integration of Warrior PRIDE into our school climate and culture over the past three years. It has made the biggest impact on our overall school climate related to safety and culture. This is especially noticeable when you compare the first semester discipline data of the past three years. Our aggression ODRs, Theft ODRs, and Dangerous Items/Weapons ODRs have decreased each year. These are all indicators of a safer school. Additionally, we have multiple types of positive recognition systems in place for students all throughout the school year that allow teachers and administrators to catch them being great and then to let the students know they see it. This includes our Warrior PRIDE cards, Students of the Month, Move Up Awards, and Personal Choice Awards. 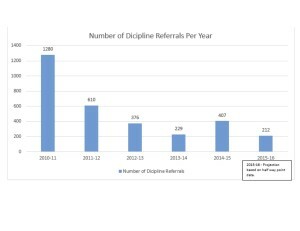 This year we have seen a significant decrease in the amount of Office Discipline Referrals we have been receiving each month. 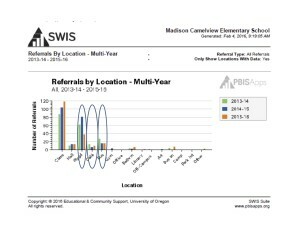 During the 2014-2015 School Year, we were seeing an average of 5 or above referrals per day. Now we are seeing less than 4 per day. 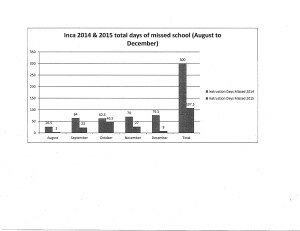 In addition, we have had a significant decrease in the amount of suspensions that have been assigned. Last year, we had over 400 days of suspension across 150 events. This year we have less than 200 days assigned across 55 events. PBIS has allowed our school to put interventions in place that focus on specific students and specific problem areas. Targeting these students has decreased their behavior and increased their success in school. 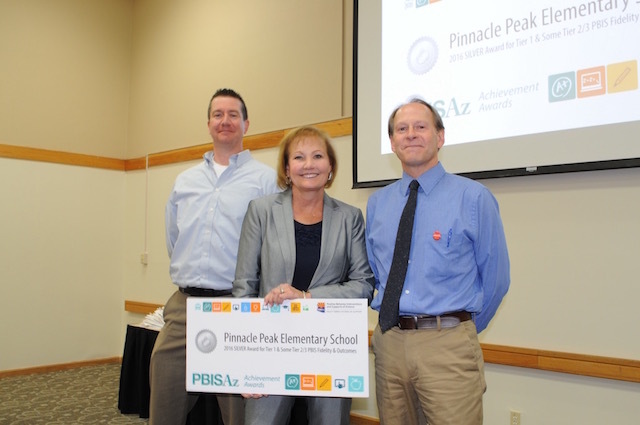 Pinnacle Peak Elementary School, in the Paradise Valley Unified School District, is in the first year of full implementation of Tier I PBIS. Our program has been branded as SOAR (Safe, Organized, Accountable and Respectful) to match our mascot, the eagle. We have been able to integrate our PBIS efforts into our already strong culture, resulting in very high fidelity of implementation by staff and strong support from our parent community. Our parents frequently report that their children share that they have received SOAR cards and report the positive behavior that was acknowledged. 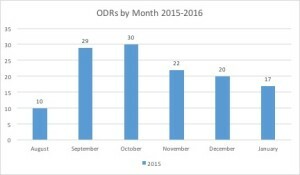 As can be seen by our chart of ODRs over the last calendar year, we have reduced our major behavior incidents to near zero. Additionally, we see behavioral gains in orderly and quiet hallways, as well as, a great reduction in the need for students visiting the office for behavior concerns or for serving consequences such as recess detention. 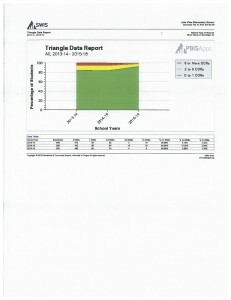 As evidenced when viewing the graph of DIBELS data, at mid-year our kindergarten and 1st grade students had already surpassed last years student’s average scores for the end of the school year. 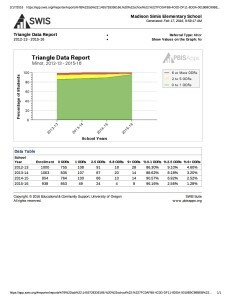 The 3rd grade DIBELS data appears to be on track to surpass last years student for the end of year assessment. Overall, there is sense of a very orderly, safe and increasingly positive school climate. 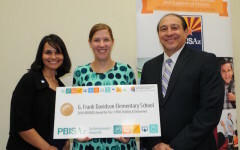 Dr. Bernard Black Elementary School (BBE) is the largest school in the Roosevelt School District located in South Phoenix. BBE services over 850 students and provides 100% free and reduced lunch. In it’s eleven year history, BBE has undergone high staff turnover at the administrative and teacher levels, which has resulted in widespread instability with regard to student achievement and character development. 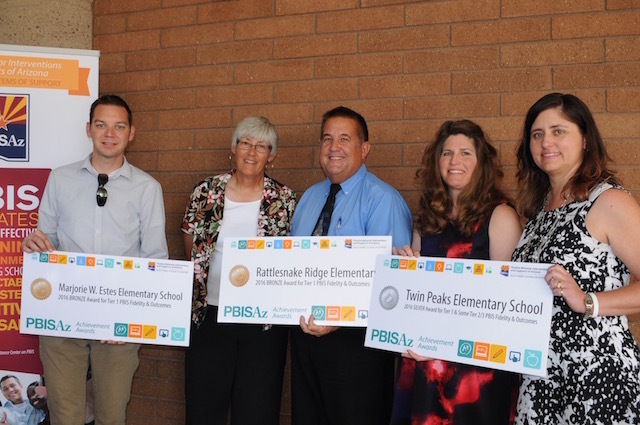 Following several rocky years, the school was provided with an opportunity for change when it was accepted into ADE’s MTSB PBIS grant program. A dedicated group of teachers and support staff, lead by Principal Dr. Moore, committed their free time and efforts to influence change and create a prosocial climate for everyone walking through BBE’s door. Following our initial roll out in 2014, BBE has consistently displayed high fidelity of implementation of all critical Teir 1 components (see attached SET results). The PBIS team has supported teachers and staff in training students on the school’s expectations. In addition to teaching universal expectations, all students are reinforced for displaying desired behaviors while conversely, students exhibiting needs for support and intervention are provided with systematic and data driven interventions designed to keep them in the classroom while learning and contributing in pro-social ways. Currently, data collected as been used to appropriately identify students in need of Tier 2 and Tier 3 interventions. 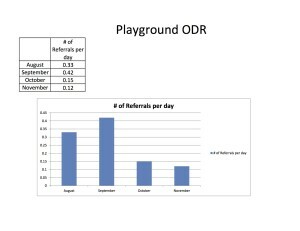 Areas of concerns, such as the playground, were targeted and now have displayed significant decreases in problem behaviors and subsequent Office Discipline Referrals (ODRs). While the problem solving continues, data collection and analysis continues to be the driving force of the PBIS team so we can continue our positive progression. Prior to our initial roll out, the office experienced over 1500 ODRs! Following our first year of implementation, we displayed a 15% decrease in ODRs which has resulted in a gain of 84 instructional hours! Currently, BBE is ranked 6th (out of 18) in Reading and 5th in Math, our school population continues to grow as our students and teachers are happy and have a sense of community not previously felt at BBE. 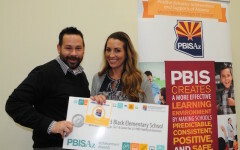 Dr. Bernard Black Elementary School continues to grow in both size and spirit in large part due to the positive impact that PBIS has had on students, teachers, staff, and families. 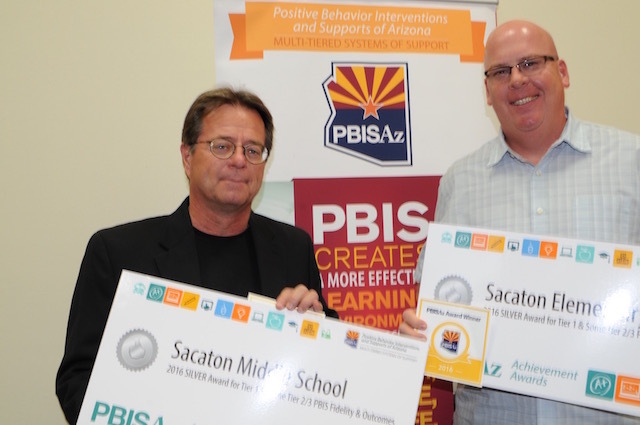 PBIS has continued to have a positive impact at Sacaton Middle School. Currently in our fifth year, with our population composed 100% of Native American Pima students, teachers have come to realize that our students can actively participate in their education without open acts of defiance. With the continued implementation of PBIS at our Middle School we find that students are very responsive to the strategy of providing students immediate specific feedback with a Brave’s Buck and daily school-wide recognition. With the continued implementation of a Tier 2 intervention, CICO, it has continued to give the extra support to our students as teachers provided immediate feedback on their personal behavioral goals each day. We started with 10 identified CICO students and graduated 2 of those students so far this year. As we continue to train staff to maintain program fidelity, teachers have reported many positive aspects including: students enjoying receiving Brave’s Bucks, students’ attitudes have positively shifted, and PBIS language has become our school norm. 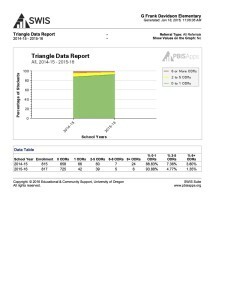 With a SET Implementation Score of 98%, we are well on our way to move to the next phase of PBIS to address Tier 3 interventions. With students responding positively to PBIS procedures and teachers continuing to implement PBIS with fidelity, we are confident that we will continue to see positive academic as well as behavioral student growth. 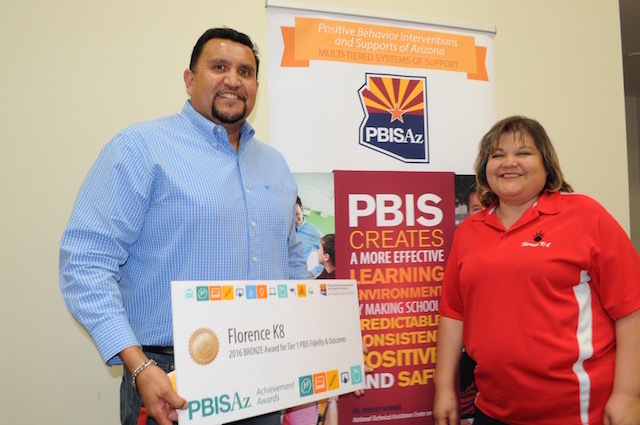 Sacaton Elementary School is now in their third year of implementation of PBIS. With our continued implementation of PBIS we are finding that the students are responding positively to the immediate feedback with a Braves’ Buck. Our teachers are utilizing the tools they have been given to deal with minor behaviors in their classrooms and as a result, less behaviors are being sent to the office. The implementation of CICO this year has given extra support to students who need Tier 2 interventions by receiving immediate feedback on their behavior goals each day. With a SET score or 97% we are excited to continue to provide our students with additional Tier 2 and Tier 3 supports. We are eager to continue to see the positive trend of less ODR’s, an increase in academic achievement, as well as positive behavior growth. 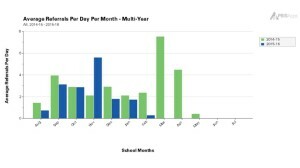 Our Bales data demonstrates a reduction in unwanted classroom behaviors, especially in defiance and major disruptions. 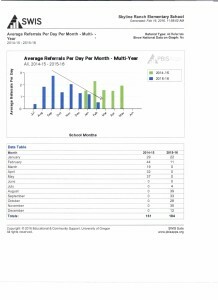 The only month with an increase in office referrals was in November, in which a new 7th grade teacher was hired and the students were attempting to not conform to the school rules. Prior to the new 7th grade teacher arriving, there were three long-term substitute teachers because the students purposely tried to get rid of each temporary teacher. Once the 7th grade students began to respond to appropriate expectations, the office referrals declined while teaching and learning was again the primary focus of the grade level. Positive Behavior Intervention Support has provided tools for all teachers to utilize in their classroom instruction. Continuous re-teaching of expectations and collaboration in professional development has allowed for standardization of the main school rules. A safe, kind, respectful and responsible environment is being created for both students and staff. 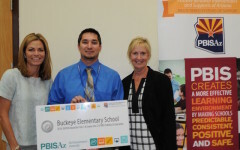 Sundance Elementary has implemented PBIS this year and we have seen the benefits in our students and school. Our year one team worked hard to design schoolwide matrix and posters, develop lesson plans for teaching and re-teaching expectations and are filmed what to do and what not to do videos. Every member of the Sundance staff has participated in the expectations lessons. After winter break we had PBIS assemblies to help reteach our school wide expectations with a fun jeopardy game that our mascot even participated in. Horseshoes continue to be pulled daily during morning announcements to recognize students caught showing PBIS behavior. 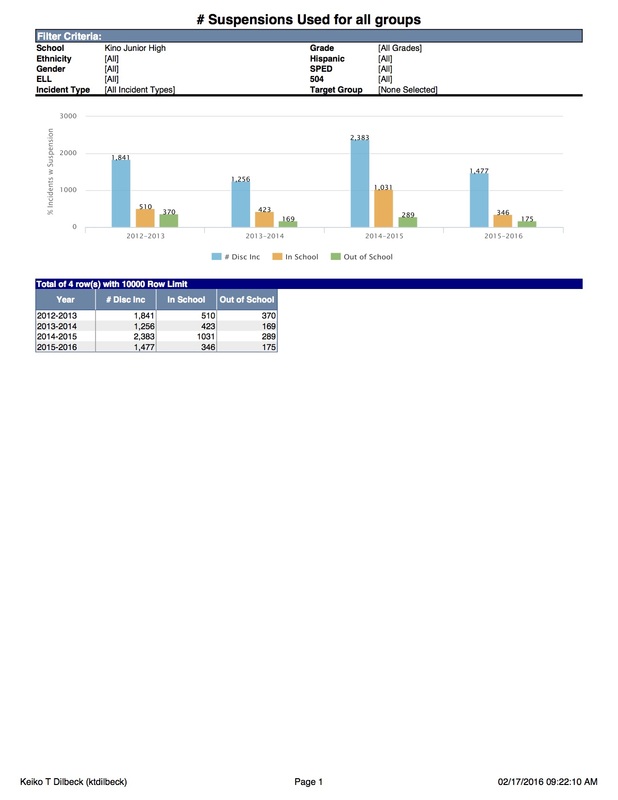 We are using our SWIS data tracker and the referrals for this year are down compared to last year. 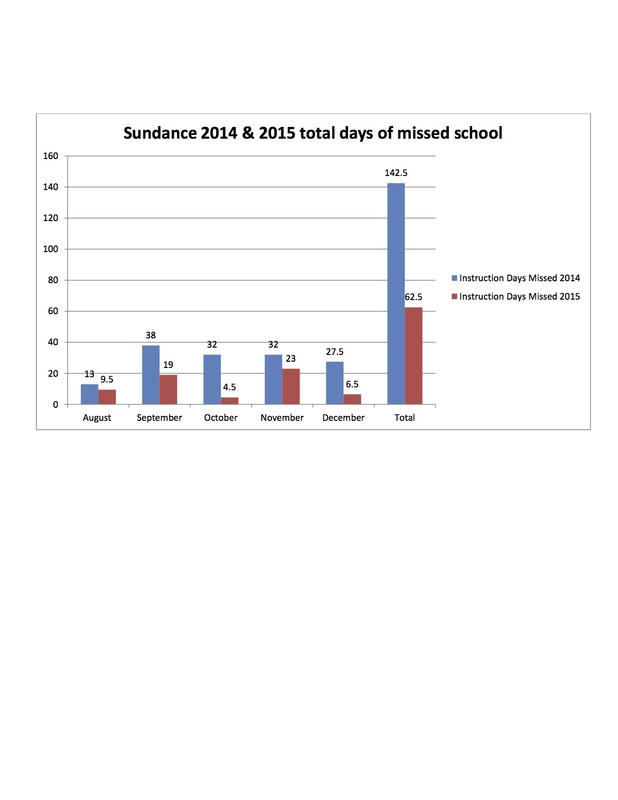 In addition we have gained 78 days of instruction due to a reduction in students being suspended. We credit this with our staff passing out positive Mustang horseshoes and rewarding the behavior we love seeing in our school. We are excited as our Year 2 teams learns the ins and outs of the Check In Check Out System and we can further support those students who are struggling with day to day behaviors. Sundance also completed their SET and received a 96% Implementation Average score showing our Tier 1 is fully implemented. It has definitely been encouraging to see the positive impact PBIS has had on our campus. 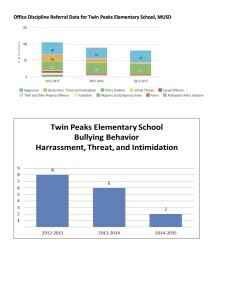 PBIS has had a significant impact on our students’ behaviors at Tomahawk Elementary. It is clear that students know and understand all of the expectations on the behavior matrix. PBIS expectations are taught daily through explicit, direct instruction in all classrooms. They are reviewed weekly and referenced consistently in daily announcements. Specifically, one major positive change that we experienced involved students’ behaviors after winter break. 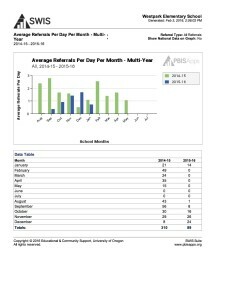 Our data showed a significant decrease in student referrals in January 2016 compared to January 2015. We attribute this to teacher and staff commitment to re-teaching the expected behaviors. We have also observed students from different grade levels restating expectations and, more importantly, explaining why those expectations were made. This is due to the overall consistency in teaching expected behaviors across our campus, from kindergarten to fifth grade, MAP (music, art and PE) and support staff. Lastly, now that behaviors are improving, teachers are better able to focus on first best instruction in order to meet the ultimate goal of overall student success. 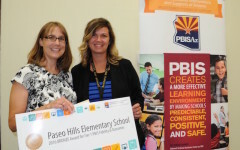 PBIS has positively impacted Davidson Elementary in two different ways. First, it has motivated the PBIS team to gain focus for our staff development. Entering the third year of PBIS at Davidson Elementary, our data indicated to us that we needed to be intentional with our Tier One instruction. We felt that the most efficient way for us to help our staff was to create a PBIS binder. In this binder, we included resources such as a staff handbook, Tier One lesson plans and behavior posters, interventions and supports for Tiers Two and Three, and a letter so that substitutes could help reinforce Tier One instruction while on our campus. Additionally, we created a parent brochure that we distributed to parents at our school’s fall festival and began dialogue with parents about Davidson’s expectations. During the first quarter of the year, our professional development focused on The Functions of Behaviors and how they relate to interactions between students and staff. Secondly, we have seen some positive effects between our professional development efforts and our discipline data. 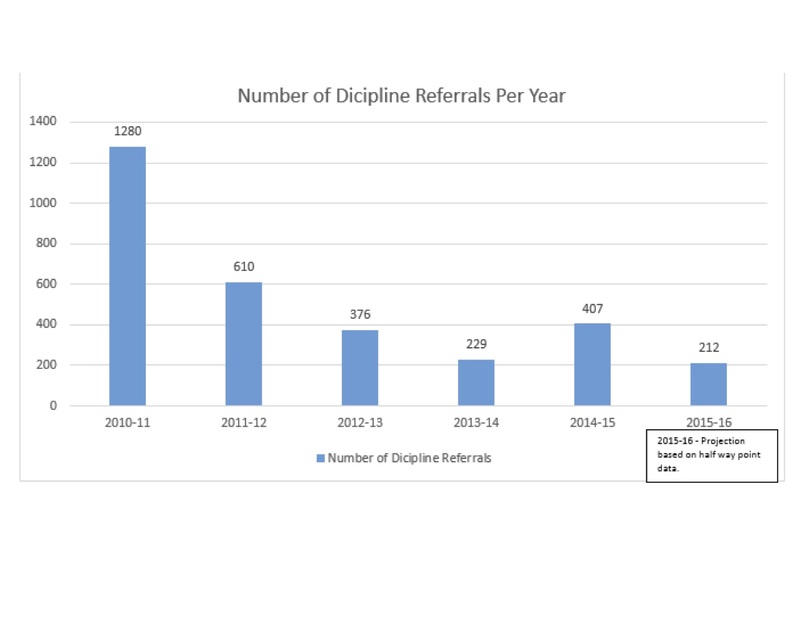 We have noticed a 14% decline in office discipline referrals on our campus. 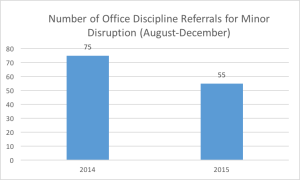 Our team is hopeful that as we gain experience analyzing data, we will continue this downward trend of office discipline referrals. PBIS has given our school common vocabulary and expectations from grades Kindergarten through 8th Grade. Our school has created and implemented school-wide PBiS expectations. Since Implementing PBIS our school climate has become more cohesive, positive and structured. Teachers have a clear knowledge of implementing positive interventions in classroom and are able to access RTI – B Specialists as needed when students continue to struggle with expectations. 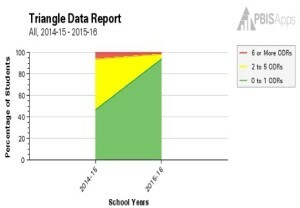 Adding RTI – B Specialists to our school has significantly decreased on-campus suspensions. Our RTI – B Specialists support our students by reflecting on situations, providing small group support, and strategies that promote positive interactions which has increased time students are spending in their classrooms learning. The PBIS program at Avalon has provided a much needed definition of schoolwide expectations. The school was struggling with how to best provide the safe environement for our scholars and found the PBIS program. After the implimentation of PBIS we noticed a dramatic change in the feel and culture of our school campus. Our team was able to track down problem areas because of our ability to track Office Discipline Reports and make improvements based on that information. Hallways are no longer used as a social gathering place, the playground is safer, and the scholars are in the classrooms rather than the office. This program has provided us the guidance as to how to keep our scholars in the classroom and how to provide a positive environment for them to learn in. This experience and learning of the program has made a positive impact on our school and our scholars. PBIS has changed the culture of our school. It has created a common language in regards to behavior between staff and students. Specifically, the culture focuses on good character, service, and safety. To support the program a reward system has been implemented to acknowledge students and staff for displaying positive behaviors. As a result of this program we have seen a shift in teacher behavior in regards to giving more attention to the positive behaviors displayed by students. In turn, students have stepped up their behavior in an attempt to be recognized. 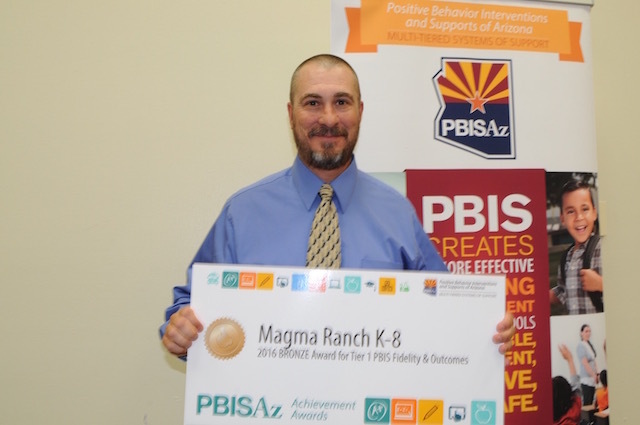 Magma Ranch has implemented the Positive Behavior Interventions and Support Program (PBIS) over the course of the 2015-2016 school year. Since the incentive program has been introduced and up and running, the climate of the school has made a rapid improvement in gaining a positive atmosphere. We have found that being on the lookout for positive behavior drastically decreased negative behavior. Our data has proven this through the average number of referrals versus Caught in the Act Tickets we pass out each month. 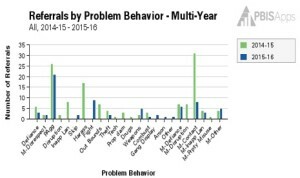 The school shows a remarkable dip in behavioral problems through documented referrals, from last year’s data, and a major increase in students striving to be responsible, respectful and making right choices. Tier 1 of Anthem’s PBIS program, P.R.I.D.E., was implemented at the beginning of the 2015-16 school year; the staff worked together to create a set of overall as well as site specific student expectations that were then taught to the students during the first week of school. Overall, the program has been an enormous success as evidenced by both our 95% implementation average on the school-wide evaluation tool (SET) and the more than 60% reduction in office discipline referrals (ODRs) when comparing the first semester of 2014-15 to the first semester of 2015-16. 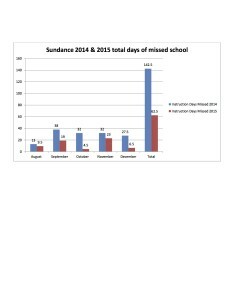 Moreover, many out of school suspensions in 2014-15 resulted from events that took place outside of the classroom. 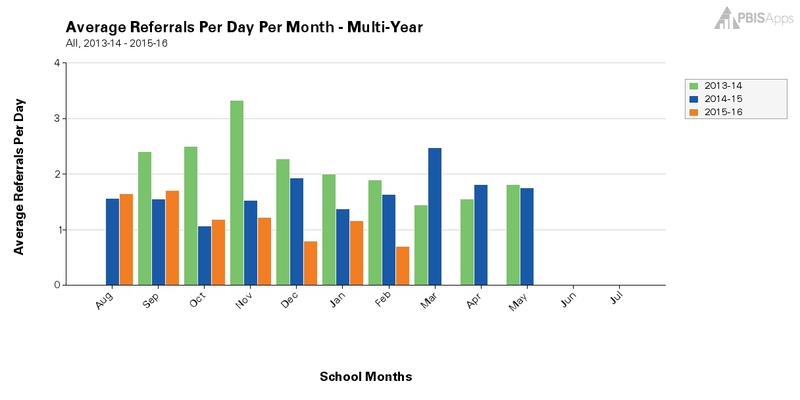 During the first four months of 2015-16, July through October, Anthem saw a reduction in the number of students suspended out of school, per day per month, for incidents taking place in non-classroom areas such as the cafeteria, playground, hallways, or other common areas. We feel that much of this improvement can be directly attributed to Anthem P.R.I.D.E. as these are areas with explicitly defined student expectations. Additionally, P.R.I.D.E. and its attributes of participation, respect, integrity, diversity, and excellence, have become part of the language and overall climate of Anthem K-8. We look forward to the continued evolution of our program and the achievements that will invariably accompany it. 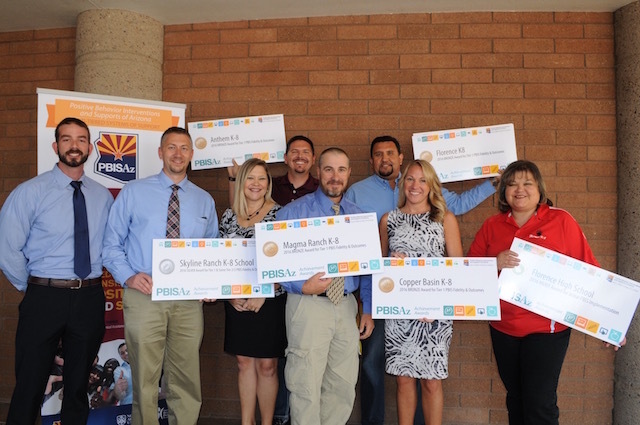 In the 2015-2016 school year Copper Basin K-8 fully implemented Positive Behavior Intervention and Support (PBIS). 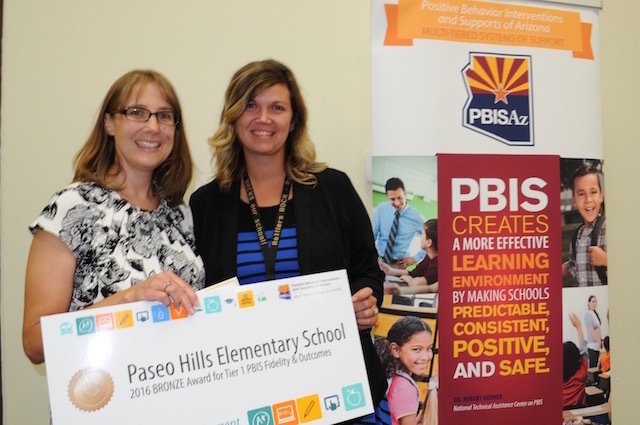 PBIS has helped create a safe and positive learning environment for students and staff. Students are taught behavior expectations daily in all settings of our school. When positive behavior is witnessed, (Safe, Respectful, Responsible & Empathetic) it is recognized and celebrated at the individual, classroom and school wide level. Since full implementation, students, staff, parents and community members have expressed positive feedback regarding PBIS. 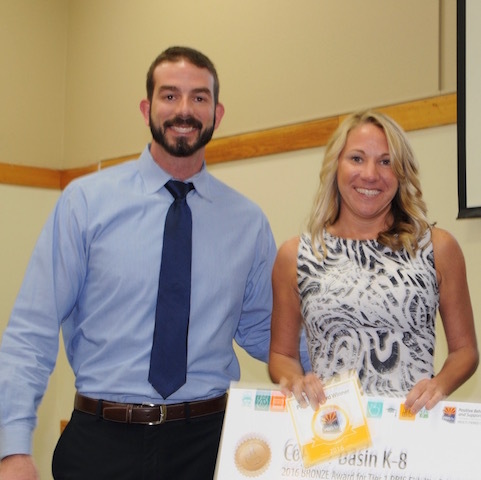 “As a parent at Copper Basin, the PBIS program has had such a positive impact on how my children interact with other students and participate for a chance to receive a Dusty Ticket. This helps them stay focused.” Teachers at our school appreciate the consistency of the expectations and the students’ desire to be empathetic. While we are only in the beginning stages of full implementation we have already seen a drop in discipline and a rise in our benchmark scores. We are excited and look forward to continuing our positive journey with PBIS. 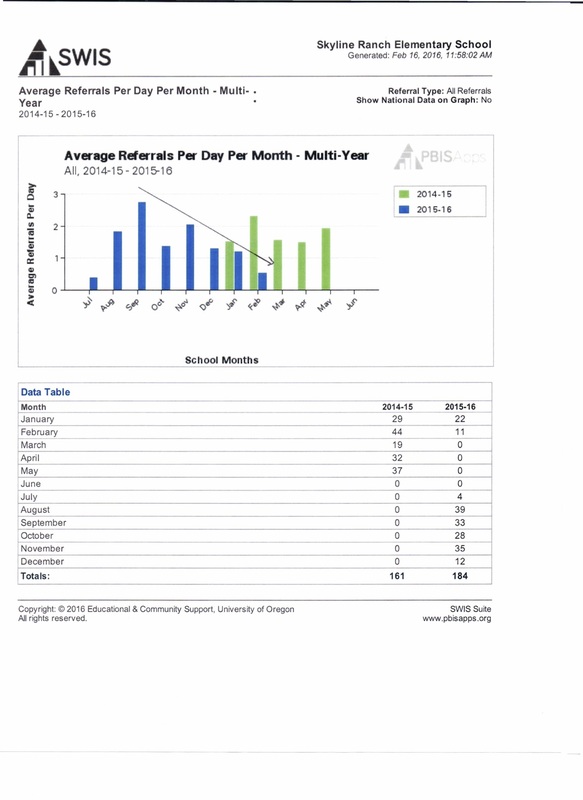 PBIS has helped our school reduce discipline data. Create a common language among staff, students and parents about what behavior is expected at our school. Since students are better behaved teachers have gained more time for instruction and administrators are able to be in classrooms more to focus on teaching and learning as opposed to problem behaviors. PBIS has made such an impact on our school. Pueblo Del Sol is a k-8 school with an enrollment of around 1150. We are in our first year of implementation. Not only have we seen a decrease in office referrals of 46% over the previous year, but we have had a shift in the culture and climate of our school. When students are sent to the office with a referral, they are better prepared to discuss their choices and make correction. This is a result of the clear communication they have received from our teachers following a consistent set of rules and procedures. The use of a focused proactive approach to addressing issues on our campus has allowed us to significantly decrease the aggression and fights on our campus. The result of all this has been fewer suspension which means more instructional minutes for our students which will have a positive impact on student achievement. At Madison Park, we live and breathe Extraordinary Learning for All. This is a statement that all schools in our district value. We are constantly gathering data and making informed decisions based on our data and as such we have seen significant change academically and behaviorally. As a whole, we believe in partnering with our students and families to foster a safe, respectful, and rigorous learning environment. This learning environment that we create empowers and engages our individuals to thrive as global citizens. Preparing our students for life during their time at school and once they finish school is crucial. Students as a whole ROAR, they practice Respect, Outreach, Achievement, and show Responsibility. Our data has shown that the positive changes we have made to our behavior systems in response to the training in PBIS are evident. From August to January, our overall referral counts have decreased from 237 referrals last year to 157 referrals this year. Looking further into our data, our classroom disruption referrals have decreased from the previous year in three out of four months. From September to December, our numbers are as follows: 17 down to 3, 13 down to 6, 9 to 10, and 5 down to 1. Even though the month of November was a very slight increase, our overall numbers indicate that students are finding value in monitoring their behaviors and making positive choices. Students are recognized for these positive behavior changes from all staff members on campus and even by their peers. They are then recognized further through our ROAR assemblies. During these assemblies, data is shared with the students and valuable discussions are then had. The increased data sharing is another celebration for our school. Our data sharing with students and staff have increased and valuable discussions and decisions are being made. In addition to this, students are motivated to earn tickets and get that immediate recognition for the great things they do on campus which is a switch from the sticker system we had implemented last year. We were not having the same buy-in with the sticker system as we are with the tickets this year. Students are being recognized for positive behaviors on a more consistent basis and they are even able to articulate when and for what they earned a ROAR ticket for. Our campus is noticeably stronger this year as opposed to years prior and this is in direct response to our continued work with our PBIS trainings. Our data and observations are proof that we are moving in the right direction and we are excited to see where we will go from here. 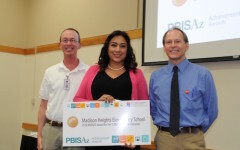 At Madison Heights, PBIS continues to positively impact students, staff and community. Our teachers and staff continue to recognize positive behaviors through our 3 Keys to Success: Respect, Responsibility, and Participation. We provide behavioral interventions to those students in need. In the first week of school, students attended an energetic and engaging PBIS Kickoff assembly. They learned the expectations, found out about reinforcements and participated in our PBIS chant. Teachers followed up by explicitly teaching students how to follow the expectations in all common areas of our school. During our Back to School Night, parents received our school’s PBIS information in a PBIS Parent pamphlet. In comparison to last year, our referrals have increased, from 51 referrals in the first semester of 2014-2015 school year, to 157 referrals in the first semester of 2015-2016 school year. We attribute this to teachers participating in Tier 1 with better fidelity and students held to a higher standard with PBIS. 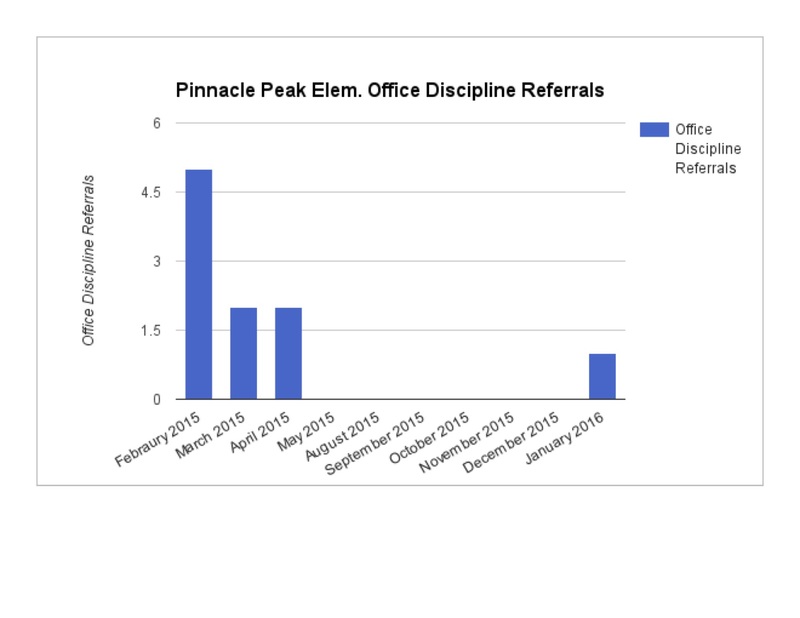 Our PBIS team has noticed a decrease in office discipline referrals every month. We expect to meet our overall PBIS school goal, i.e. to decrease the number of office discipline referrals by 25% from Q1 to Q4. Madison Heights has continued to provide supports for the staff and students when an area of need is identified. 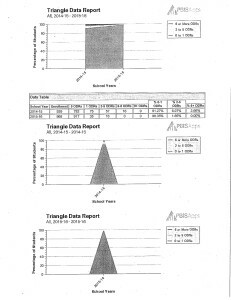 Our PBIS team provides monthly data to their grade level teams, and results from the Big 5 graphs are reported to teachers quarterly. Students participate in weekly reminders of the 3 Keys to Success and PBIS boosters when needed. PBIS has helped our students improve their behavior, self esteem, and academics. PBIS has instilled a school culture of mutual respect between our staff and students. Our students are responsible and value participation and safety. Our visitors enjoy watching the positive tickets pile up in our Keys to Success holder awarded to students by the staff this school year. 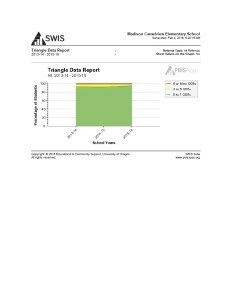 Our NWEA/MAP school data demonstrates significant and continuous academic growth in reading and math this year that is attributed to PBIS. The Positive Behavior Intervention Support framework is an active part of our campus climate. Our students practice these behaviors daily. Our students as well as our staff uses the same terminology and language across campus to ensure fidelity of the model as well as clarity. We use a multi-tiered approach to positive reinforcement for our students which provides significant opportunities for the adults on campus to acknowledge and recognize those behaviors we want to emphasize and reinforce with our students. We have enjoyed a decline in negative behaviors while seeing our campus become a place with a more positive atmosphere. Over the last few years at Estes Elementary School, increasing enrollment has created a need to establish solid PBIS systems and practices. These systems have made a positive impact on the culture of our school. The PBIS team is made up of representatives from across the grade levels and includes specialists and support staff members as well. 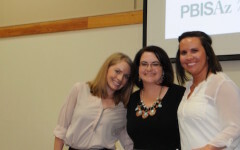 Initiatives derived from this team have created opportunities for teachers to assume leadership roles and interact with teachers from other grade levels in support of PBIS. They meet monthly to review data and refine PBIS systems at the school. At the tier 1 level, there are three expectations established, a location matrix with expectations listed for each area, a rewards system in place and a data monitoring system. 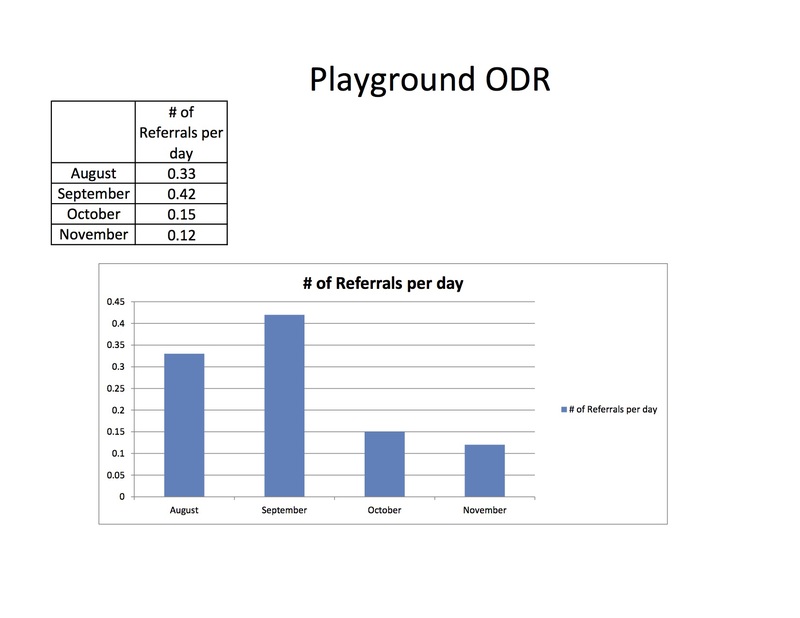 The PBIS team also shares ODR data with the staff quarterly, so they are aware of the violations that are occurring. Also, the team sends a parent newsletter, quarterly, to provide parents with updates about PBIS at the school and also tips and resources for them to use at home. At the beginning of the school year and after winter break, presentations are given by a student leadership team about the expectations in key locations of the school (i.e. cafeteria, playground, restrooms, and buses). The students rotate through the stations with a “buddy class”. This has been helpful not only so that all students understand the expectations, but also because it has encouraged students to build relationships with students in other grade levels. 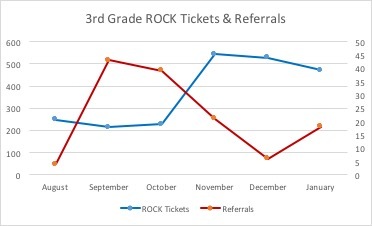 This year, one of the goals on our PBIS Action Plan is to increase positive behavior recognition with our Eagle Eye tickets, which was identified as an area for improvement from the SET results last year. There are PBIS prize drawings for a staff member (who distributed the ticket) and for the students (who received it) every week. This has increased the teachers’ attentiveness to recognizing positive behavior and using the reward system. To create consistency and transparency in regards to the discipline process, a behavior flow chart was created with staff input. It explains the process for responding to problem behaviors as well as a breakdown of the major and minor behaviors that were agreed upon by the staff. With foundational tier 1 supports in place, the PBIS team has shifted the focus to strengthening tier 2 support. To identify students in need of tier 2 supports, a behavior screener (SRSS) was administered at the beginning of the school year to identify students. A behavior support team was formed with the purpose of identifying students in need of tier 2 interventions and to pair students with appropriate interventions. 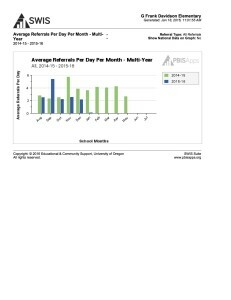 The PBIS team uses this data in combination with ODR data to identify students for check in/check out as well. Members of the PBIS team serve as advocates for a check in/check out intervention. Also, there are intervention groups for each grade level to teach students social skills. These interventions are being tracked each quarter. At tier 3, the PBIS team has facilitated the process of creating FBA’s and behavior plans for students. With increasing staff commitment and solid PBIS systems in place, the goal is to make PBIS sustainable at our school for many years to come. PBIS is beginning to change the culture of our school. Prior to PBIS, there were many inconsistent practices. Now, we have common school wide expectations that drive our learning environment. Faculty, staff, students, and parents have a clear understanding of our school wide expectations which are taught and retaught consistently. Our behavior matrix and flow chart is in every student handbook for quick reference purposes and to aid in the re-teaching of practices as needed. Our reinforcement system of POP dollars along with quarterly assemblies and quarterly celebrations allow us to continually reinforce all of the positive actions of our students. And as a result, we are starting to see some positive shifts in our discipline data, particularly in the areas of defiance/disrespect, dress code, and inappropriate language. To be certain, PBIS is having a positive impact on Rhodes Junior High School. 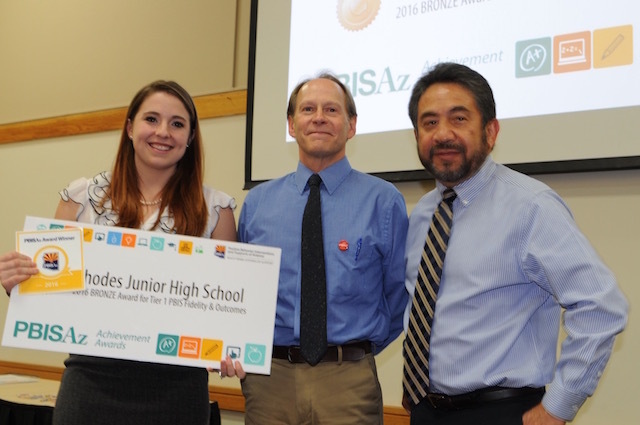 Kino Junior High School is in our first year of implementation with PBIS–and we were very excited to do so! Our school is Title I, with 76% Hispanic, 38% English as Primary Language, 90% free and reduced lunch, nearly 70% of teachers with 3 years or less experience, and three new principals in three years. To say we need a grounding force to focus us is an understatement. This year, PBIS has been the agent of change on our campus. In the three areas of responsibility, respect, and safety, we have establish expectations that have shaped teacher instruction, student/staff behaviors, and even our interaction with our parents. 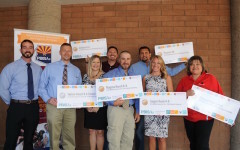 Students can earn Kino Cash from any student they come in contact with, from the bus driver, to the front office staff, to their teachers, and the food/nutrition staff. Bus drivers and substitute teachers are thrilled about the turn around and have said they have gone from actively avoiding Kino Junior High School to requesting the school. The impact we have seen is transformative: attendance is up 3% over the last three years, overall discipline incidents have been cut by 56%, and out suspensions (in and out) have gone from 1320 in 14/15 SY to 495 in the 15/16 SY (see data reports). We are proud to call Kino Junior High School a PBIS school and lead our school district and community in a positive direction. Our first year implementing PBIS at Davidson Elementary has significantly changed the culture and climate of our school for the better. There is a feeling of calm and order among students and staff members as we have developed a new identity at Davidson Elementary School. Positive student behavior is consistently and frequently acknowledged by staff, our students’ achievements are recognized monthly, and our students are thrilled each time they are acknowledged for making good choices and ROARing! 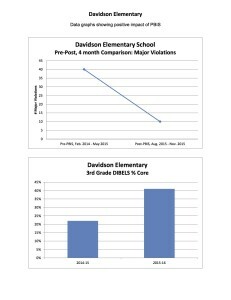 This year, Davidson students are demonstrating successful behaviors at a much higher rate, compared to last year, which means there have been significantly less incidents requiring office intervention, exclusionary practice, or suspension. 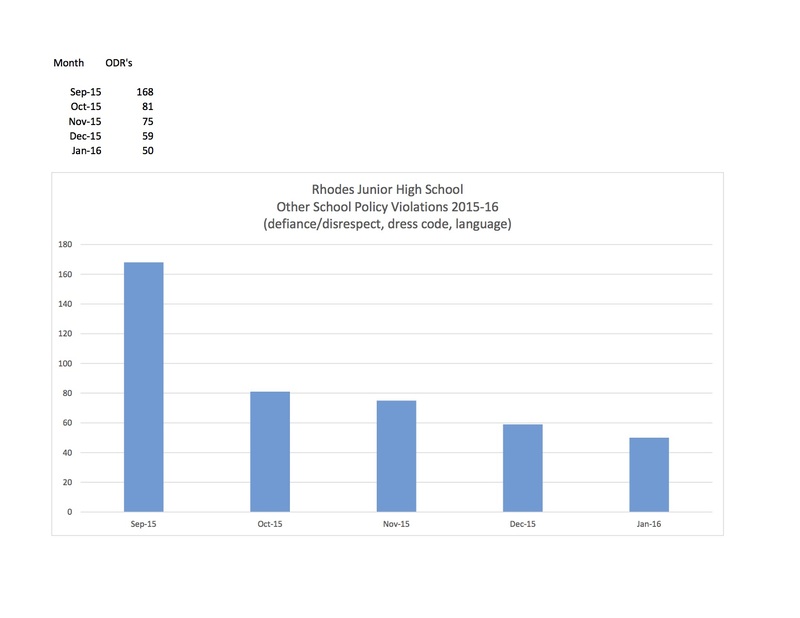 “Major” violations have decreased 75% from the last 4 months of the 2014-15’ school year compared to the first 4 months of the 2015-16’ school year and 92% of our students have not received an Office Discipline Referral this year. This change has improved our ability to monitor and respond to the needs of individual students through our MTSS team process. 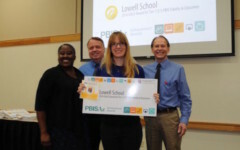 Shared leadership in implementing PBIS practices school-wide and the belief in all students has fostered a positive environment for all Davidson students. 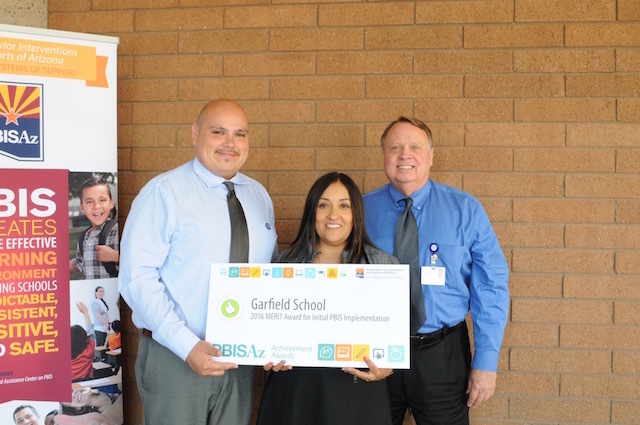 The level of student and staff participation in PBIS at Desert Sands Middle School has supported our goals for success. Positive relationships have developed between teachers and students. The campus is a pleasant and safe place to learn and develop lifelong social skills. The shared focus for behavior supports school climate and is well-defined. 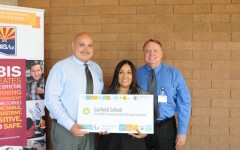 Deserts Sands Middle School has reduced office referrals and disruptions to the education process. 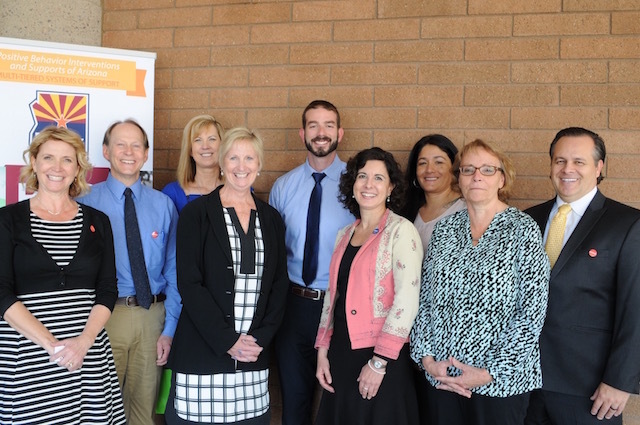 The change we are seeing supports the innovative and progressive goals of the Cartwright School District. Currently, discipline rates are down, learning is a top focus and support of the PBIS system is solidified. Circle Cross Ranch K-8 has faced a number of challenges since it opened in 2007. In 8 years, the school has had 3 principals and a large staff turnover. The first principal left after 2 years to open the new high school in our district. The second principal was a new administrator with limited experience. In the 2011-12 school year, 56% of the teachers left CCR and the following 2012-13 school year, 47% of teachers left. In 2013, Rebecca Hendry transferred from an in-district school to be the principal at CCR. There was much work to be done. The school was rated a “C” by the AZ Department of Education with 112 points on the letter grading scale. It was clear in the first year that staff and student morale was low and improving school climate and student achievement needed to be a priority. The past two years we have focused our efforts on changing the culture and climate at Circle Cross Ranch. Part of this process was finding a way to empower students to grow academically and reach their full potential. Building strong relationships with students was critical and our team determined from the beginning that this would be a priority. 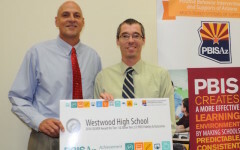 Our assistant principal, Mr. Scott Johnson has tracked our student discipline closely and found that our efforts, strategies, programs and accountability procedures are showing positive results. 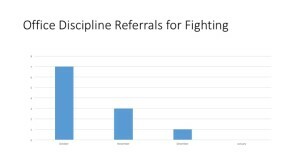 Discipline referrals have been reduced by more than 70% over the past two years. PBIS has positively impacted our school. Students on campus are mindful of our school wide expectations and strive to follow them. They are excited to show and tell you about their actions and how they relate to the program. We have seen a decline in behavior problems and increase in positive behavior. Students and staff have embraced the program and it is exciting to see the positive changes. 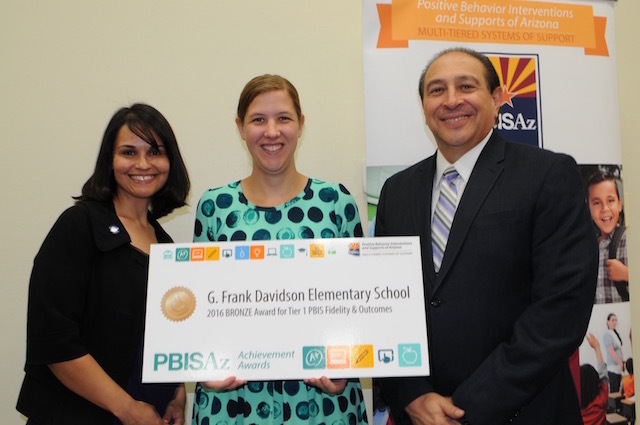 The 2015-16 school year is our first year implementing Positive Behavior Interventions and Supports (PBIS). It has drastically changed the overall climate here at our campus. Teachers and students both feel, along with parents, that this campus is safe, and consistently upholds a positive learning environment. This aspect leads to less disciplinary action as well. Teachers have noticed an upswing in positive attitudes with in their class and even the school. Along with academics and performance, teachers have told me that PBIS has helped them with their overall classroom management. This leads to more productive lessons and activities. Which, in turn, leads to a more positive classroom environment, less negative behavior, and better scores and grades. Also, these lessons and activities are more engaging which is a direct correlation to less disciplinary referrals and/or negative actions. We hand out RRocK (Responsibilty, Respect and Kindness) tickets to students who are caught doing the right or positive things (language, actions). Students are excited about getting a RRocK tickets. They love to be complimented publicly, and also they look forward getting their name drawn on every Friday for incentives for getting RRocK tickets. 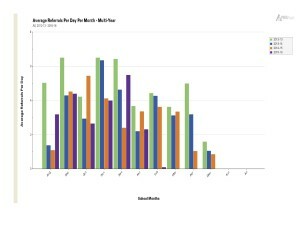 Through the PBIS SWIS application the graphs back up all of this data. 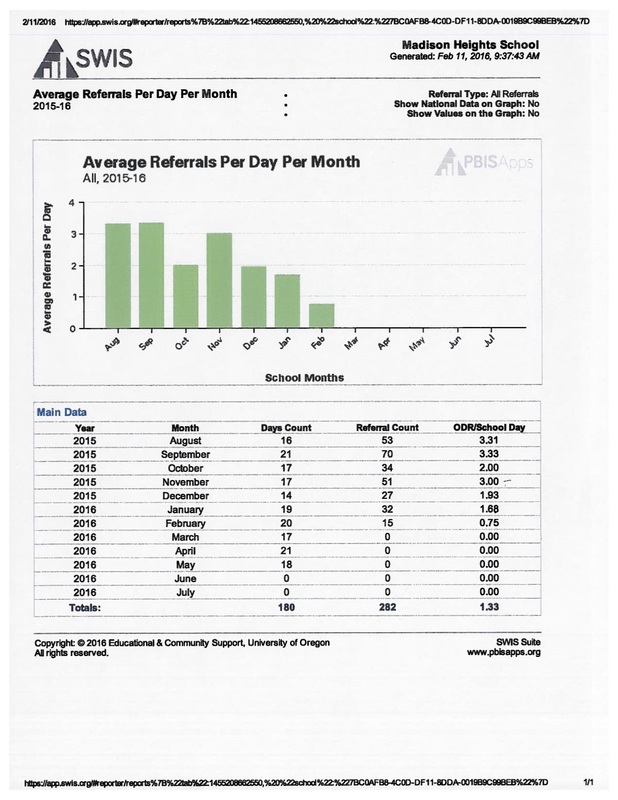 The PBIS team can analyze specific topics such as behaviors, grades, students, problem areas, referrals per day, and referrals per month. Knowing all of this data, the team can see what adjustments need to be made in order to correctly implement PBIS. Lastly, all of us believe that this campus is truly headed in the right direction to become a positive beacon within our community. PBIS has positively impacted our school. Implementation of the new PBIS system has solidified more clear expectations for varied behaviors within our school. It has brought clarification to the proper steps and process for positive reinforcement and intervention. It allows us to better track and analyze student behavior through data collected. Within our school community, we have shifted our mindset as a whole to more positive thinking in order to build better relationships with our students. The Positive Behavioral Intervention and Support program has made a positive impact on our campus this year. We expanded our team to include members from special areas, after school programs and support staff to ensure that the program is consistently supported campus-wide. This has resulted in better communication between staff members and therefore better behavior with students. The behavior expectations are now the same throughout campus and at all times. The use of positive reinforcement has helped decrease off task behavior in classes as well. At first teachers believed that focusing on behavior may detract from academics, but they have seen our use of tickets and rewards has actually increased motivation to complete academic work and do their best. 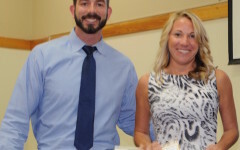 Rose Lane has added quarterly booster assemblies for each grade level as well as classroom celebrations which have also contributed to a positive climate on campus. Rose Lane is a school with a high number of open enrollment students. Parents report that they choose Rose Lane because they can see and feel how the positive support and inclusion gives a real feeling of community. PBIS has helped strengthen the school as a whole. At Madison Meadows Middle School, PBIS has had a positive impact on the school climate. The staff, students, and parents know the rules and expectations put forward in our RAMS (Respect and responsibility, achievement, maintain cooperation and communication, and safety) expectations. Students receive recognition for meeting these expectations. The students can earn RAMS tickets or stamps. The students can then turn the tickets or stamps in for different rewards. Each teacher or grade level has their own reward menu the students can choose from or we have a RAMS store every other Friday where the students can use their tickets. Our students can also earn a positive reward for going above and beyond demonstrating their RAMS. By having these rewards, students get to be acknowledged for their positive behavior. When others see students getting rewarded for positive behaviors it can be contagious. 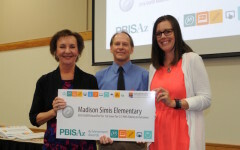 Overall, the teachers and staff at Madison Meadows take pride in the PBIS framework and feel that it has helped Meadows to establish a safe, caring, and positive environment for our students. Here at Meadows we are committed to extraordinary learning for all. PBIS has helped us in our vision for our school. At the Madison Traditional Academy the PBIS Team is working to create an environment where students are recognized for the positive behaviors. The students are very responsive to the positive reinforcement that we currently have in place; that being our FAB (Flying Above and Beyond) award . MTA is proud of the high academic achievement of our students due to the fact that we have lower behavioral issues allow for a focus on instructional time. Although we are in the beginning stages, we look forward to having a consistent structure for positive behavior support for the entire K-8 population. 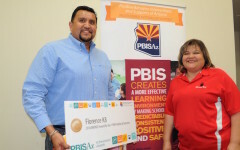 PBIS had its roots years ago at Guerrero Elementary. 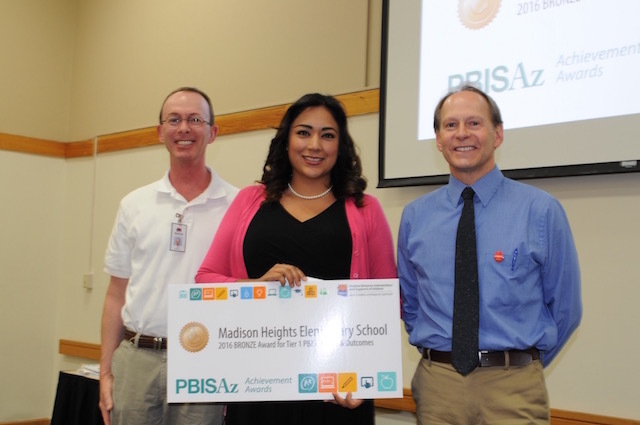 It has been revitalized with the adoption of the district goal of bringing PBIS to all schools in Mesa Public Schools. The staff at Guerrero opened their arms to the positive potential of PBIS and all it has to offer for staff, students, and families. The core PBIS team has worked many hours to develop systems that mesh well with the culture of the school and needs of the staff. In the past year, we feel a change in the attitude of teachers from a punishment and reactive belief to intervention and preventative strategies. The school sees the potential of this system and is working toward implementing all components of the system with fidelity. At this time, the school feels a change in climate and as we fine tune systems, we are looking forward to data that demonstrates the results of our new systems and beliefs. As we begin this journey to a more positive and cooperative campus to help children learn and grow, we embrace PBIS and all it has to enhance our school. We agreed as a staff that we needed a school wide system of community and accountability. We chose PBIS. As a team we created our expectations and matrix. We have created definitions for behaviors and revised them. We have a student incentive plan in place and have several levels of student recognition from class stores to donated prizes in PRIDE assemblies. While we are just in the beginning stages of PBIS, we already see benefits. Students all know and can state behavior expectations, teachers are recognizing appropriate behaviors and reinforcing them. Our parents know our expectations and support us. The local community is supporting us through donations for our PRIDE assemblies. We understand that we have a long way to go but feel we are on the right path and are willing to put in the effort to successfully implement all tiers. 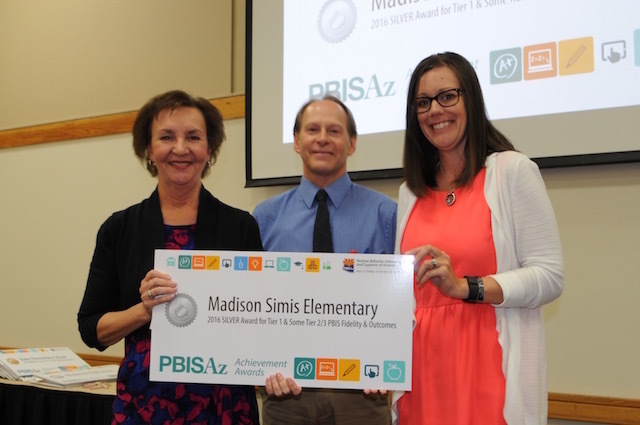 Mohave Valley Junior High began implementing PBIS at the beginning of the 2015-16 school year. Prior to the implementation, MVJH had broad and vague expectations for staff and students in regards to behavior. Many of the guidelines pertaining to behavior tended to be punitive. Now that MVJH has implemented PBIS, we have clearly defined school-wide expectations that staff as well as students are very familiar with. We have seen great improvements with staff members recognizing the positive behaviors witnessed instead of focusing on the negative behaviors. This has created a more positive learning environment for the students and also a more positive work place for staff members. Fort Mojave Elementary is in its initial year of implementation. 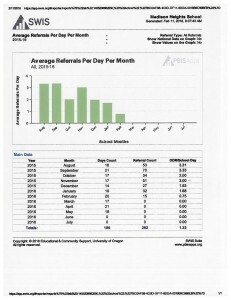 While the SET score shows that we are fully implemented, the change of data collection has prevented us from showing a decline in referrals as we are cleaning up the data to be more accurate. The PBIS program has allowed us to streamline our expectations so they are clear to everyone, to teach them in a clear manner, and to recognize the students who are examples of what are expectations are. Camp Mohave Elementary is in it’s first year of implementation and we see more excitement on campus from students who are being positively recognized for their behaviors where as many in the past were ignored so the focus could be placed on the negative behaviors. This shift has changed the climate and made many of our students much more willing to grown and learn. 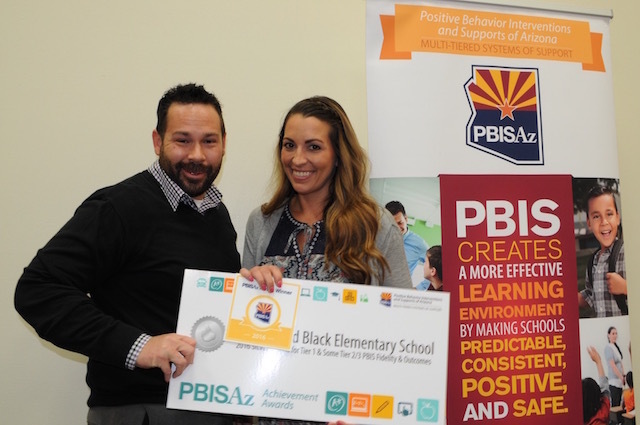 This year is Mountain Vista School’s planning year of Positive Behavior Intervention System (PBIS) Tier 1, and we are already seeing why this is called a positive behavior intervention. Even though we do not officially roll out until next year, we have seen a positive impact in teacher/parent communication as well as a general sense of excitement about improving our learning environment. We have asked for and received great input from our certified and classified staff, parents and guardians, and our students about exactly what their expectations are for each other. The expectations don’t just include students; they include everybody in our learning community. The students were shocked that the adults had behavioral expectations of themselves and were not just, “out to get the students”. We experienced a complete paradigm shift away from the teachers versus students model to a learning community of collaboration and cooperation. The students immediately bought in and are clearly developing high expectations of what they want to see at “their” school with regard to learning environment and positive relationships between them and staff. Because parents really feel engaged in this process and that their concerns and ideas are being listened to, we are seeing a much higher than usual level of parent participation in our planning and development. It was a huge endeavor to acquire everyone’s input, but it was completed in a timely manner and well worth the effort. The re-opening of communication between the school and parents in a positive light has proven to be a benefit to our school. The entire community surrounding our school is gearing up and getting excited about our roll out in August because we will have universal procedures and language. We are confident that our commitment to careful planning, continual improvement, and PBIS, will ensure Mountain Vista is a highly effective and empowered learning community. Desert View students are well on their way to becoming model citizens, thanks to the staff using the PBIS (Positive Behavioral Intervention and Support) system. The PBIS committee helps facilitate improvements to our processes within the system of positive-behavior supports that acknowledge students for following PRIDE: Positive, Respectful, Involved, Determined, Excellent. PRIDE expectations were agreed for each area so that our school operates consistently, regardless of location or adult supervisor. Students who follow school rules are acknowledged by teachers and staff with PRIDE paws. Those who earn the PRIDE paws are entered into weekly and sometimes daily drawings for prizes. These incentives range from pencils to backpacks to bicycles. Students are recognized through daily school announcements and school-wide assemblies. 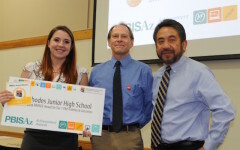 Desert View has seen a positive change in behavior and attitude among students over the span of the program, now in its fifth year. The committee uses monthly data to determine how to improve the program. The collected data helps the committee determine trends in the school or focus on certain groups of students who need a little extra positive motivation and strategies. 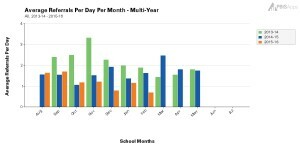 The data also helps the committee determine monthly target areas and implementation of positive school wide activities. At Page High School, the positive impact of PBIS is seen daily in our classrooms, hallways, assemblies, and common areas. Students are responsive to the acknowledgement of meeting our school’s PRIDE expectations (Positive, Respectful, Involved, Determined, and Excellent). Students are excited to collect the PRIDE cards they receive from teachers. The cards are part of the acknowledgement process when students meet a behavioral expectation on our PRIDE matrix. As students collect them, they can turn them in for a variety of incentives at our school student store. The awareness of our PRIDE Expectations has created a common language that teachers, staff, and students share; a language of expectations which has helped foster a positive and supportive school climate. PBIS has made a huge difference in our classrooms. Thanks to the GRR reinforcement tickets we are focused on the positive behaviors our students display. This has increased the engagement taking place in the classroom and eliminating our unwanted behaviors. 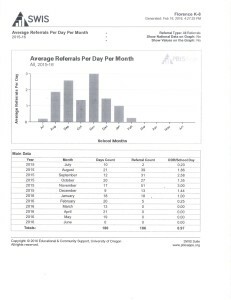 For example, in the beginning of the school year we saw a huge number of office discipline referrals but over the next few months you will see the numbers drop each month and eventually reach zero. In addition to our GRR tickets and drawings, we have utilized the CICO system which has allowed for us to help our Tier 2 students become successful in a different manner. For example, a 5th grade student who has struggled for years is currently using the CICO out system. The first 3 weeks had passed and we weren’t seeing much change. We continued meeting with the student, discussing the behaviors, and provided them with a caring adult to work with. Moving forward we saw great changes in his attitude, behavior and academics. PBIS has been a positive impact to our school. The positive language and support systems have allowed us to change the climate of our school and increase the relationships between students, families, and teachers. PBIS has impacted our school by creating a universal system of expectations. All staff, students and parents are aware that respect, responsibility and safety are to be demonstrated in all areas of the school. Students have practiced and know what these expectations look like in each area of the school. Students are excited to earn Wiley bucks for demonstrating these expectations. They enjoy spending them at the Wiley store and saving them to earn special incentives. The climate of the school continues to improve as evidenced by staff, student and parent survey results. A majority of the comments focused on an appreciation of the safe climate, referencing the addition of an SRO on campus. Also notably mentioned were comments about a feeling of respect across all areas of the school. 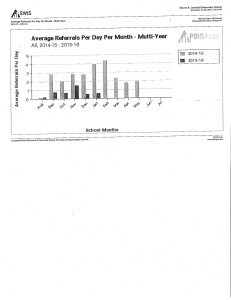 Whittier’s consistently low discipline referral rates this year speak to the positive effects of PBIS on the school. 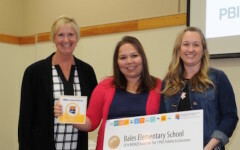 PBIS has positively affected Bethune Elementary School in a variety of ways. First and foremost, PBIS has significantly improved our campus’ school climate as students are aware of our school expectations of being respectful, responsible, and positive. According to KOI Education data we’ve received, our behavior issues have decreased by 10% from 2014 to 2015, which has led to an increase in teaching and learning in the classrooms. 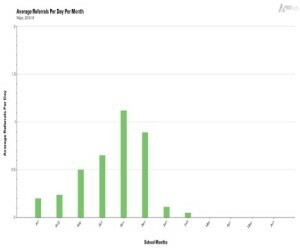 A decrease in referrals was particularly obvious when we implemented a one week long Bear Down ticket blitz from February 1st through February 5th. The blitz required teachers and staff to distribute special Bear Down tickets on the recess yard before school, during recess, and after school to curb discipline issues as most referrals occurred on the playground during unstructured times. Students were asked to turn in their tickets for a chance to participate in a special PBIS party. The entire event was a huge success that couldn’t have been done without the enthusiasm and commitment from our amazing teachers and staff. This prize, along with our weekly, monthly, and trimester prizes, engage the students to put their best foot forward in all that they do. In addition, PBIS has given us a foundation to implement new interventions such as peer tutoring, which we are beginning later this month. PBIS has positively impacted our school by improving our climate, decreasing suspensions, fostering a downward trend in ODRs, and increasing effective interventions that can meet our students specific needs. A new roll out of the PBIS system was kicked off fresh in our 2015-16 school year and since this kick off our climate has become more positive. According to our climate surveys staff feel safer and believe that everyone treats each other with more respect. Staff reported feeling happier to come to work and supported. Since our kick off for the 2015-16 school year Dunbar is down 42%for suspensions which equals an increase in instructional time. Despite our decrease in suspensions we observe a rise in ODRs from Aug to Nov., but from Dec to Feb referrals have dropped by at least 3%. 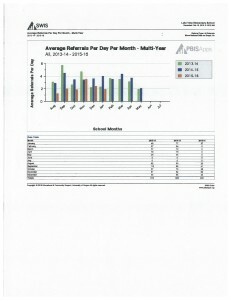 This evidence lets us know that with the consistent implementation of the PBIS system change is becoming noticeable. This 2015-16 school year is year 2 for Dunbar entering us into Tier 3 implementation. Through PBIS we have introduced the school to evidenced based Interventions that are targetted toward the specific behavior. 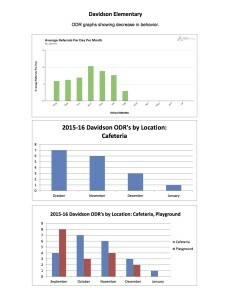 We attribute these interventions as well to the decrease in suspensions as well as the decline in ODRs. 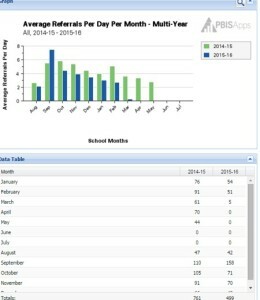 By looking at our data and surveys it is apparent that PBIS is making a positive impact in Dunbar Elementary School. We all are united as a team under our expectations for meeting our Mission and Vision. This began during our summer planning time in which a team developed 8 weeks of lesson plans to begin teaching a common language for learning among all of our grade levels. Within these 8 weeks we used the content of our school motto that All Super Senators have Super PRIDE. The content for the 8 weeks of lessons focused on our acronym for PRIDE. P= Proud of our choices, R=Responsible, I= Innovative, D=Determined to Learn, E=Eager to Help. The lessons introduces examples of what each of these would look like in the school areas, homes, public places and also friends homes. We utilize our Super Shields and Student of the Month Awards around behaviors that meet the Super PRIDE expectations. PBIS has brought a positive impact to Aguilar Elementary School by providing strong curriculum including character education and social skills school-wide. Through its implementation, PBIS has designed structure for students and staff by creating and following a student Behavior Matrix, Discipline Flowchart, Staff Expectation Matrix and Think-Time (behavior processing) procedure. Routine expectation reviews are practiced frequently throughout the year to maintain overall consistency. Due to the development of a common language and collaboration among staff, PBIS has helped Aguilar to increase positivity. PBIS has also encouraged teachers to hold higher expectations of students. Since PBIS has been fully implemented, our student achievement has shown growth highly due to thorough use of “positive paws” tickets and praise for reinforcement of desired behavior school-wide. PBIS has given uniform to not only our school but to our district as well in helping with communication and collaboration. We are striving to make PBIS a solid foundation for the students and staff at Aguilar Elementary School to make it an even better place! At Rover Elementary School, we foster a calm, safe, and welcoming environment throughout our campus. We strive for students and staff to be respectful to self, others, and the environment, accept responsibility, make good choices, and soar to the challenge (Rover RAMS behaviors). The implementation of PBIS has given Rover a common language amongst teachers, staff, parents, and students, and thus allowing for a strong collaboration amongst all. Since the implementation of PBIS, Rover has developed a culture that provides a strong sense of belonging, the right to respect, and the expectation for everyone to show RAMS behavior. Our teachers are a most integral part of this culture as they have implemented these practices through effective and positive instructional practices that contribute to a healthy and rewarding lifestyle. Our school is consistently a top-performing school in our district on academic measures and a school where students rise at the opportunity to apply their knowledge based on a strong confidence to learn. Additionally, through positive behavioral practices, we have developed routines that focus on building relationships on a daily basis, hosting community involvement on a monthly basis, and providing every student with a “buddy” student on our campus from a different grade level who collaborate regularly. Our buddy system, that also includes our students who experience significant cognitive and physical handicaps, brightens the lives of all the staff and students on our campus. We warmly welcome each student to our school, and we involve every student in our positive school community. 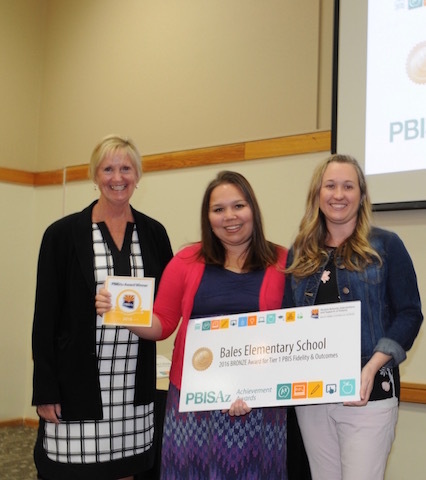 Our PBIS program incorporates frequent recognition of students’ positive behaviors through daily RAMS awards given by teachers and daily recognitions on the announcements, weekly school-wide awards ceremonies, and weekly school-wide attendance celebrations. Staff members are also frequently shown appreciation from our school’s Parent/Teacher Association via regular breakfasts and treats. Rover is a place where we consider everyone to be a contributor to the success of every student through PBIS. PBIS focuses our attention on our students strengths and provides us monthly opportunities to celebrate all the ways our students are respectful, responsible, safe, and kind. More importantly, our staff approach behavioral expectations in the same way as we approach reading, math, and science: we only expect students to know what we explicitly teach. Working through our matrix and our lesson plans helped our PBIS team think through every routine, procedure, and expectation across all parts of our school. This clarity of expectations provides all 700 of our Grizzlies with the consistency they need to learn and grow. PBIS has helped to change the staff’s perception that all students have an understanding of positive behavior. Furthermore, PBIS has given the staff tools to better assist the students with expressing their feelings and concerns in a positive manner. There is now a common language amongst us all to address different discipline/behavior situations, as well as a clear list of expectations for the students and staff to learn and utilize. Since implementing PBIS at our school, there has been a steady decrease in tier one behaviors that result in ODRs, and the climate has shifted to one that focuses on positive behavior. We have a tier one behavior tracker via Google Form set up for each grade level, and students who earn zero infractions at the end of every week earn lunch pass that moves them to the head of the line. Our token economy is the ROADIE ticket, which students are given when they are “caught” displaying a ROADIE attribute. Students use those tickets for pay-to-play events, entry into raffles, and various other prizes. Teachers are addressing students in a way that is more respectful and positive, many of whom use the ROADIE language when establishing routines and procedures. Since the implementation of PBIS at Gila Vista the students and staff are becoming more aware of the expectations set forth through the PRIDE logo. The teachers are referring to these in the classroom and around campus daily. 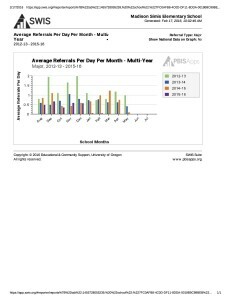 The decrease in discipline referrals is also evident from last year to the numbers that are being seen this year. The discipline rate has dropped by 52%, correlating to the TIC percentage that is increasing and we are working as a community at Gila Vista to continue with this positive direction. 1. Recognizing Students as they are coming into the classroom by standing outside the door and greeting them. 2. Promoting Positive Character Traits by posting student’s names on a bulletin board and celebrating students along with parents each month during a special award night. 3. Using the same vocabulary when praising students. 4. Building clear and consistent rules and procedures school-wide. 5. Building community awareness by addressing our school PBIS plan. 6. Meeting with staff and continually looking at discipline data and making adjustments according to findings. 7. We are still working on creating a safe space and building community with our new Blending Learning initiative. As the new principal to O.C. Johnson Elementary School this year I am very pleased with the PBIS program that we have going here. Many pieces of the program that were created in previous years have been maintained while others have been modified. Jaguar Pride can be seen school wide. ALL students know our 4 PBIS expectations: Be Respectful, Be Responsible, Be Safe and Be Your Best! Signs displayed around the school help the students to understand what each of these expectations entails in various areas around school. Those who display qualities that exemplify Jaguar Pride are awarded PAWSitive Praise tickets. One ticket from each class is drawn each week and the lucky recipient comes to the office for a prize. Every student that earns 10 (or more) of these tickets during the quarter is invited to our PAWSitive Praise Celebration. At these celebrations students are awarded a treat and extra time on the playground where they may listen to music, play a game or hang out with our mascot, Jazzy Jaguar. In the cafeteria, classes track their behavior via red and green cups. Students understand that while on green they may talk quietly with their neighbor, but if switched to red, for excess or loud talking, then their entire class must remain silent. These colors are tracked on calendars displayed in the cafeteria. Classes work to earn extra recess weekly and a treat monthly for all green cups. In order to address the needs of our Tier III students we have a check in and check out system. Students who need extra support meet with a specified teacher, counselor or the principal at the beginning of the day to set goals. They discuss what actions and behaviors are necessary to reach those goals. At the end of the day the same students check out with the same mentor. At this time they discuss their day and are awarded a score for each area: respectful, responsible, safe. The hope is that each and every student reach their score goal for the week. Overall, our PBIS program is a very strong one for our students, staff and school community members. We have worked to modify it to better meet the needs of our Tier III students and will continue to modify it to best meet the needs of our Tier II kids as well. Currently, the students know the expectations and work VERY HARD to achieve their goals and to have Jaguar Pride!! Pecan Grove Elementary School is in its second year with PBIS implementation. Our observation/data has shown a increase in: respectful climate, consistency, expectations posted, expectations being used in classroom, signals being used in crowd, bullying down, accountability, office referrals down, building new behaviors, tardiness down, common language. Our comprehensive support is on board , even making movies about the proper behavior which has helped to improve their behavior Our school has also using PBIS World which is great for our school.